Ian Forbes has fished the rivers of British Columbia for 50 years. 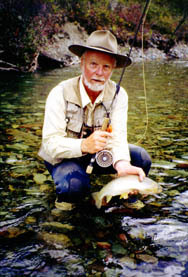 His long time employment with the BC Ministry of Forests allowed him the freedom to sample all the major rivers and most of the smaller ones. He has been a regular outdoor writer for over 30 years and had fishing articles published as far back as 1958. He is a fly tying columnist for BC Outdoors and does features for most of the outdoor magazines. He is currently living on Vancouver Island near his beloved Cowichan River. Ian specializes in fly fishing and spends about 80 days a year exploring the better fishing locations of the Province. His other loves are photography, making videos, magazine illustrations and water colour painting.